On New Year's Eve, we had a dinner party for ten. Dinner guests were our friends Clint and Karen, Max and Alice, and four friends of Max and Alice (Michael & Lisa, Michael & Betty). 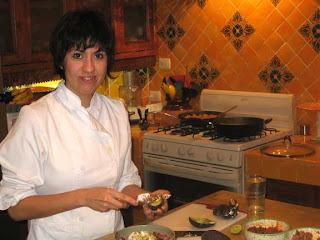 Linda's student and friend Laura, a young Mexican woman who is in cooking school, was the chef. 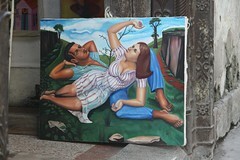 Laura is both a chef and an artist. 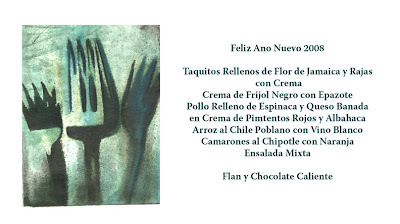 Her artwork adorned the menu (see above). Sounds yummy, doesn't it? Laura shopped and cooked most of the afternoon to have the meal ready for us. 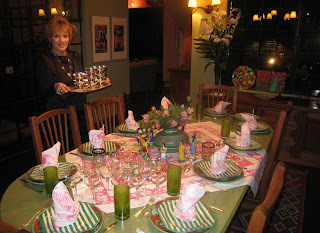 Linda, of course, set a gorgeous table, not to mention how gorgeous she looked! We started with hors d'oeuvres, wine and lots of good conversation. After an hour or so, we moved onto the main course. 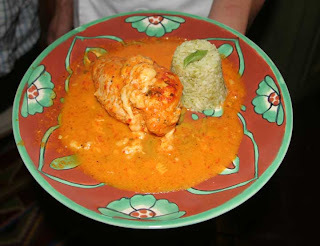 Linda and Laura did a wonderful job plating the entrees, which looked even more appetizing on our Mexican dishes. After dinner, we moved to the roof, to see (and hear) the midnight fireworks. 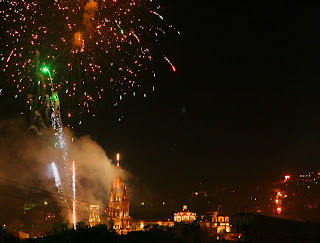 Mexicans adore fireworks (fuegos artificiales), and almost any minor holiday is an excuse for major fireworks. 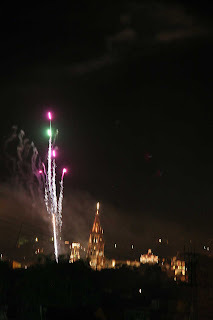 From our roof, we had a beautiful view of the Parochia (main church in the Jardin, the town square) and the fireworks.